60 Hikes within 60 Miles: Cincinnati covers the best and oftentimes little-known hiking destinations within 60 miles of the greater Cincinnati area. The hikes were selected based on family friendliness, scenery, and history. Many of the hikes fall between 3 to 5 miles in length, providing parents with a relaxing and revitalizing hike that even little ones can enjoy. Author Tammy York hiked most of… the trails with her two young daughters. 60 Hikes within 60 Miles: Cincinnati was created with other parents and newbie hikers in mind, yet it provides plenty of challenging hikes for skilled outdoor adventurers. 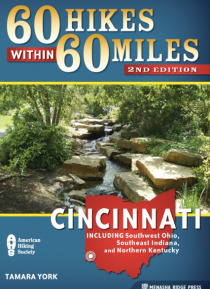 Trails in this guide cover Ohio, Indiana, and Kentucky, and range from easy to difficult.